Chef Gabriele Riva entered the world of pastry in adolescence as a young assistant in his father's pastry shop in Milan, Italy. 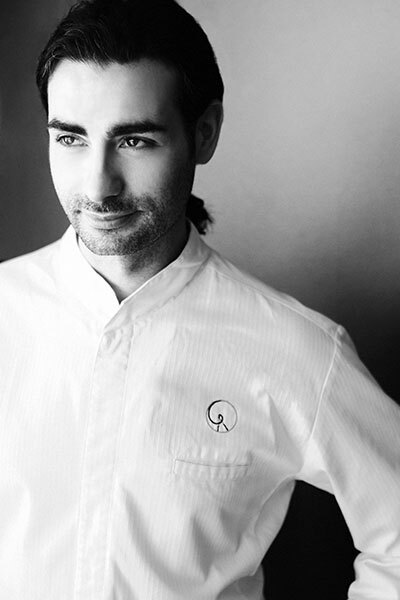 Parallel to his apprenticeship in pastry, Gabriele started training in Kung Fu, a holistic Chinese martial art. The rigorous discipline and focus prepared him for the future responsibilities of a chef. Attaining the fundamentals of traditional pastries and classic Italian desserts, he sought professional training at one of Italy’s prominent culinary institute, C.A.S.T. Alimenti Pastry School in Brescia. It was here Gabriele trained in European contemporary techniques of pastry preparations and production. Courses were taught by highly recognized international chefs and accomplished Italian instructors. Chef Riva’s professional experience commenced at Pasticceria Piave mentored by Silvano Lullini, noted as one of the best traditionally trained pastry chefs within the city of Milan. This was a formative period for a young chef to developed skills in orchestrating large-scale production, coordinating the various specialized departments: pastries, gelato and sorbet, and breads. He was given carte blanche to create unique sculptures in chocolate, sugar and pastillage for display. Cultural exposure and training outside of Italy beckoned him. London, England was where he ventured next. He worked at Patisserie Valerie located in SoHo. Within a year, he was named head pastry chef. At this juncture Chef Riva accepted the position of Executive Pastry Chef at Nobu London. This marked an enthusiastic period of creativity and personal growth. By incorporating Japanese ingredients, Asian flavors and culinary methods into his desserts, this created a new world of possibilities. Chef Riva was offered the directorship of the new pastry program and opening of Nobu’s midtown location in Manhattan, New York. He dedicated his time and knowledge to Nobu’s various national and international locations. The completion of his tenure, Chef Riva focused on the science of both Western and Eastern nutrition, and further his health and wellness studies. He has expanded his repertoire to include vegetarian and vegan diets, and address lactose and gluten concerns. Chef Riva’s modernist dessert concepts and ideas have been published in various culinary journals. Reportage on his work can be found in La Confiteria, So Good haute cuisine, and many other online publications. He is involved in new ventures and specializations in the culinary field, as well as collaborating with artists of different disciplines. As a current Ambassador for Cacao Barry he has conducted demonstrations of his unique dessert ideations, judged national pastry competitions and continues to develop new recipes and ideas for their many chocolate series.